Hands only CPR is a cardiopulmonary resuscitation class designed to teach bystanders how to perform hands-only CPR when they witness the sudden collapse of an adult. You do not need a certification to do CPR. This webpage is for my students to read before they take the class. For better retention of what you will learn, mark a date on your calendar a week or two after the class to come back and read this webpage again. This webpage is not complete training and will not substitute for a class, especially not for a CPR certification class. Cardiac arrest is a life-threatening emergency when a person’s heart stops beating. They will also stop breathing at the same time. Often it is the first sign of heart trouble. Cardiac arrest is the leading cause of death in the United States, every year killing more people than cancer, stroke, lung disease, accidents, firearms, or diabetes. Cardiac arrest affects people of all ages, even teens, twenty somethings and the very young. Most cardiac arrests happen away from a hospital where care needed to correct the condition is not readily available. If more people are trained to at least recognize the emergency, call for professional help (call 911 or the local emergency number), and do hands only CPR, more cardiac arrest victims can be saved. An automated external defibrillator (AED) is a small computer that analyzes a victim’s heart rhythm and if necessary, tells you to deliver a lifesaving shock to a victim of sudden cardiac arrest. When you turn it on it talks to you and tells you the steps to use it. An AED won’t shock someone who does not need it. Heart attacks are the leading cause of death for men and women when they lead to cardiac arrest. Almost half of the people who have heart attacks die from them. Medications to treat a heart attack and limit the damage from a heart attack must be given as soon as possible. A heart attack can happen before cardiac arrest, or the heart attack and cardiac arrest can be sudden and happen at the same time. Not all heart attacks lead directly to cardiac arrest and some heart attack victims do not notice a mild heart attack (or might not notice even more than one mild heart attack). A heart attack victim might or might not have a lot of pain; extreme weakness or tiredness might be the main symptoms. Symptoms might start out slowly or come and go. Persistent chest discomfort, pain or pressure that lasts longer than 3 to 5 minutes, or goes away and comes back, or persists even during rest. Chest discomfort, pain or pressure that spreads to the shoulder, back, neck, jaw or arms. The pain is sometimes described as a feeling of fullness, squeezing, aching or heaviness in the chest that can be mild or strong. Shortness of breath or trouble breathing that can start before pain or along with the chest discomfort or even without the chest discomfort. Nausea (feeling sick to your stomach) or vomiting. Pale, ashen, grayish or bluish skin, especially around the face. Sweating—face may be moist or person may be sweating profusely. It is sometimes described as breaking out in a cold sweat. Unexplained fatigue (tiredness) or lightheadedness. Denial of signs or symptoms. Denial can happen even when the victim is in extreme pain. For example, you might notice a family member who looks very uncomfortable, who is pale and sweating. When you ask them how they are doing you notice that they are having trouble breathing but they say it’s only a little indigestion/the flu/normal aging. If you suspect a heart attack is happening, even if they insist that you should not call 911, you should call. A person who is fully oriented to their surroundings is conscious. People can be partially conscious, for example, if they hit their head they might not know what happened to them but might know who they are and where they are. 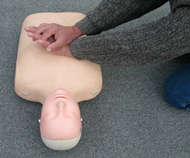 Conscious or partially conscious people do not need CPR compressions. Fainting is loss of consciousness caused by a temporary, often sudden, lack of oxygen to the brain. Example: stood up too fast after prolonged sitting or lying down (more likely for pregnant, elderly), or after a large meal (especially with alcohol). Fainting usually corrects itself when people collapse, since blood flow to their brain increases when they become horizontal and their head is at the same level as their heart. Being asleep is not the same as being unconscious (not conscious). Someone who is sleeping will wake up when you tap them on the shoulder and/or speak loudly to them, someone who is unconscious will not respond. Below you will find details of the steps in the handout. I suggest that you print the handout and follow along with it as you read the steps below. Your first step when you witness a person suddenly collapse will be to check the scene for safety. For example, if a person walks out of a chemical storage area coughing and suddenly collapses, you could be affected by the same chemical leak if you get too close too quickly. Do not risk becoming a victim yourself. Stop briefly and be sure it is safe for you to approach the victim. Other dangers you should avoid could include traffic, unstable structures, downed powerlines, explosions, smoke/fire, gas or fuel leaks, broken glass, swift-moving water, an angry dog, a crime scene, civil disturbances/riots, violent behavior and unruly fans at concerts or sporting events. You might need to turn off power / a circuit breaker. If you have disposable gloves you should put them on, but should not take time to go looking for them. and check the victim to determine if the victim is conscious or not. You tap them on the shoulder and shout “Are you okay?” and quickly look for normal breathing, which can be as simple as noticing if their chest is rising and falling from breaths they inhale/exhale. – Use the heel of the hand, not your palm, to give compressions to a child or adult. – Place your hands on the center of the chest. – an AED is ready to use (as soon as it arrives turn it on and do what it says to do). If possible, have one person continue compressions while another sets up the AED. If you become tired realize that since you either called 911 or had someone else call, help is on the way. Concentrate on pushing hard and fast . have experienced sudden and unexplained fainting and/or chest pain during physical exertion/exercise. Your doctor might advise cardiac screening with an echocardiogram (ECG) when you report some of the above. A patient who is near the end of life, or has a severe illness that is not expected to be cured or get any better, for example terminally ill with widespread cancer, can consult with their doctor and ask that a do not resuscitate (DNR) order be written by the doctor. They then will not be given CPR nor will an AED be used on them. This formal document is most likely to be found for a patient in a nursing home on their medical record. A tattoo or t-shirt that says DNR or even “do not resuscitate” is NOT to be taken as a doctor’s do-not-resuscitate order. AED quick facts includes basic instructions for using more than one model of AED (both models we have at De Anza College).